Available 2,400 pre-printed strips per package in laser sheet format. 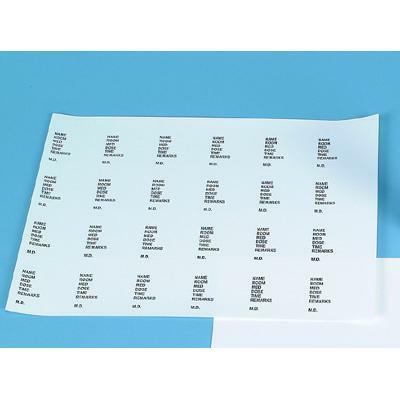 Laser sheet format allows individual strips to be printed or handwritten with patient name, drug name, strength, room, ordering physician, bar code, and more. Designed for crusher bags used with the Quiet Crusher™ and Silent Knight™ tablet crushers. Seals the open top of the crusher bag to keep meds enclosed and secure from spilling after they are crushed and until they are administered. Use as a label or a seal – or both! Medication safety! Don’t guess which crushed medication goes to a patient. Strips printed and placed over crusher bags clearly identify the patient and medication so that the right drug is given to the right patient. Prepare patient medications in advance for multiple rounds. The closure strip will properly identify and seal each bag so it can be stored in a cart drawer or med tray until time of delivery. Bag with printed strip can also be used as a delivery or dispensing method for medications that are not crushed. *Available 2400 pre-printed strips per package in laser sheet format (#9835). *Available 2400 blank strips per package in laser sheet format for printing (#9836). *Available 1,000 per roll with a glossy surface that cannot be printed or written (#9834). Pre-printed sheets include Name, Room, Med, Dose, Time, Remarks, and MD. Blank laser closure strips can be printed using our #5117 Bar Code and Labeling Software. We’ve created and included a pre-defined template for the laser closure strip. No setup is needed, all you do is type information in the fields of the template.